From the beginning, MGM set out to enhance its community by making meaningful investments in workforce development, economic inclusion, and community engagement. Soon after signing a community benefits agreement with the County, MGM chose the Greater Washington Community Foundation to manage its grantmaking through the MGM National Harbor Community Fund. For instance, MGM Resorts International Regional Vice President of Community Engagement Danielle White serves on The Community Foundation’s Advisory Board in Prince George’s County, MGM National Harbor has hosted The Community Foundation in Prince George’s County’s Civic Leadership Awards for several years and Community Foundation staff have been invited to brief MGM’s internal grants council on pressing community needs. “It’s a tight-knit relationship,” says White. MGM National Harbor employees volunteer at local nonprofit Food & Friends. Nowhere is that more evident than the confidence MGM has placed in The Community Foundation’s management and distribution of $150,000 in annual grants through Sharing Prince George’s. This funding goes to effective nonprofit organizations addressing the economic security needs of county residents by providing education, workforce development and safety-net services. “The bottom line is The Community Foundation makes sure Prince George’s County is successful by identifying funding opportunities that provide a direct impact to the people,” said White. “Through the course of time The Community Foundation has developed strong partnerships with local nonprofit organizations.” says White. “When they make a recommendation, it involves a rigorous review of large and small institutions that may be unfamiliar to us.” For instance, White was recently introduced to Nick’s Place, a 20-year old organization with a mission to assist young men in their journey through the disease of addiction and alcoholism. “We are seeing so many young men who are desperate to have a sober and safe community,” said Rhea McVicker, founder of Nick’s Place, named for her son, Nicholas Cristarella, whose life ended at age 22 as a result of the disease of addiction and alcoholism. “We don’t receive funding from the government, so any grant we receive is meaningful, but the $20,000 grant from Sharing Prince George’s is especially meaningful,” said McVicker. The funding will support the organization’s relapse prevention education and weeknight dinner program. In addition to Nick’s Place, the full list of 2018 Sharing Prince George’s grantees is available here. You can learn more about Sharing Prince George’s here. 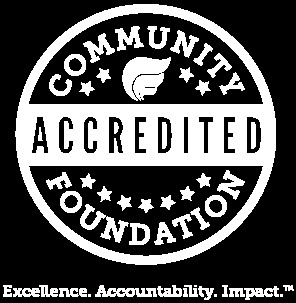 The Community Foundation has a long history of helping businesses establish and manage their philanthropic investments to create benefits for communities throughout the Greater Washington region. The DC Convention Center and Jack Cooke Kent Stadium (now FedEx Field) are among many examples over our 46-year history. If you are interested in learning more about our philanthropic advisory services for businesses, including the facilitation and execution of Community Benefit Agreements, please contact Desiree Griffin-Moore at dgriffin@thecommunityfoundation.org.